Published in the Dover Express, 14 March, 1980. The somewhat temporary military work of the time of Richard II. was succeeded, in 1540, by Archcliffe Fort, built by Henry VIII. Later, when the South Coast was threatened by the Spanish Armada, this fort had to be strengthened. According to the report of the Captain of Archcliffe Fort, made at that time, the gate-house, the ramparts, and the two flanks that should secure the seaside trenches were in decay. Again, in the reign of James I, it became necessary to spend more money on the repair of Archcliffe Fort. That was on the occasion of the war in the Netherlands, when in 1624, an army of 12,000 men was brought to Dover and embarked to Holland. This was a very rough time at Dover, for the troops, gathered from all parts of England, were so ill-disciplined and ill-fed, that they threatened to burn the town. This sort of thing prevailed about that time. A Royal proclamation was issued three years later, by Charles I, proclaiming martial law, and authorising the erection of such “gallowes and gibbetts“ as were thought fit, and thereupon to cause “offenders to be executed in open view that others might take warning.'' After the Restoration, Archcliffe Fort was fully manned, having within it a captain, a lieutenant, an ensign, a sergeant, two corporals, sixty soldiers, one drummer and a gunner. In 1780, during the war then raging, £1,200 was spent in bringing Archclifle Fort up to date. About 1870, the Fort was armed with heavy muzzle-loading rifled guns, which remained long after they became obsolete, the site being too low for it to be worth re-arming; but, on the western side, some small quick-firing guns were placed so as to prevent landing parties taking advantage of the shelter of the cliffs. The fort became the headquarters of the Royal Engineers when the Ordnance Board sold the Maison Dieu in 1834, Though part of Archcliffe Fort disappeared with the removal of the railway tunnel beneath it, Archcliffe Fort Yard remains. It was for many years the local headquarters of the Cinque Ports (Fortress) Royal Engineers Territorials. Prior to 1930, there was a definite fortified headland, known as Archcliffe Point, under which there ran a railway tunnel. In order to provide better railway approach to their new goods yards and engine sheds, the Southern Railway arranged with the War Office to remove the fortifications — which had been obsolete for years — and cut away the cliff side, so that the tunnel no longer exists. This headland was originally called Archcliffe Point. It is further on that we come to the great, or arch cliff, which we now call Shakespeare Cliff. The spelling Archcliffe is comparatively recent. The first structure which occupied this point was a fortification, and it has been commonly supposed that the work was originated by Henry VIII. It is on record, however, that in the year 1379, the second of the reign of Richard II., a building, surrounded by a ditch or moat, was erected here, the work finding employment for fifty men for forty days. Even before that time there was a watch tower where Archcliffe Fort stood, so that the surrounding building, with the ditch and moat, in 1379, was but an addition to meet the necessities of those times. It needs but a glance at contemporary history to see how critical the position of Dover then was. Edward III. and the Black Prince, who had carried the war far into France, and who, with the aid of the Cinque Ports Navy, had swept all the French ships out of the Channel, were dead, and Richard, a mere boy of ten, had to face the turning tide of French retaliation. On the withdrawal of the English forces from the Continent, the French ships put to sea, committing terrible ravages at Hythe, Winchelsea, and Hastings. Dover escaped, because the Duke of York, the then Lord Warden, was at Dover with 10,000 men recently returned from France; but as that force could not be permanently retained, the local authorities were compelled to fortify themselves, therefore this tower was built at Archcliffe. The old Crosswall entrance to the Granville Dock with its curious clocktowers on either side. On the skyline are the long gone South Front Barracks with the much smaller military hospital below from which began the funeral procession for Sergeant Monger after his death from wounds received when a gun burst during a volunteers' exercise already referred to. 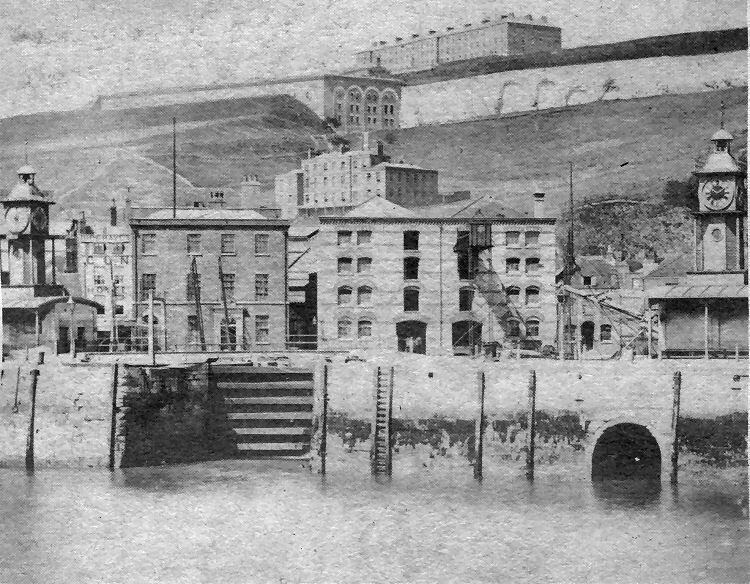 In the other above, the Western Docks area is shown as it appeared in about 1865, when the Admiralty Pier extension was being constructed. The Granville Dock had been drained of water at the time. In the foreground is Strond Street with Holy Trinity Church and the old harbour station on the right There was no Marine Station but the old town station can be seen linked by a bridge with the Lord Warden Hotel — now Southern House. Two early cross-Channel paddle steamers are in the outer, tidal dock. Top left are the North and South Piers — and the open sea. There was no Admiralty Harbour then.